I have recently blogged about Tracker for analyzing videos of physics lab experiments. I like this approach to low-resolution measurement in classes, because it provides much better data than most hand measurements at much tighter time intervals, with much less effort. I liked it so much that I even spent a week improving the velocity and acceleration computations done by Tracker. It certainly beats the ticker tape and buzzer-with-carbon-paper approach we used in the physics class I took back in 1969–70. Incidentally, such devices are still made and sold, see http://www.agalabs.com/ticker-tape-timer.htm, for example. A slightly more modern update uses a periodic spark, see http://www.pfstar.com/Accelerator-Spark-Timer_p_31537.html, for example. Some people even use motors with eccentric weights to get sort-of periodic marks on ticker tape (see https://store.schoolspecialty.com/OA_HTML/ibeCCtpItmDspRte.jsp?minisite=10224&item=43777, for example). Although I’m fairly pleased with Tracker, I recently found out about an iPad app that may appeal to those already have an iPad2. Reviewed in Jacobs Physics: Vernier Video Physics for the iPad 2: A Winner, the Vernier Video Physics app looks like it might be handy in a physics classroom. Greg Jacobs was particularly pleased that the filming could be done with the same hardware and app as the analysis, so that a lot less data transfer and context switching was needed. I can see how that could be a real advantage in the tight time constraints of a short class period. I’m afraid I can’t review the app myself, as I don’t have an iPad2, and I have no intention of buying one in the next year or so. From the New York Times: Sorry, Strivers – Talent Matters. In the NYTimes article, David Z. Hambrick and Elizabeth J. Meinz argued that the “10,000 hours of practice” documented by K. Anders Ericsson and popularized by Malcolm Gladwell in Outliers were not a sufficient recipe for excellence. In their own research “working memory capacity, a core component of intellectual ability, predicts success in a wide variety of complex activities” One study on sight-reading music by piano players (a similar, but not identical task to the evaluation of musicians in Ericsson’s work), they found that amount of practice had a large effect, but that there was also a “medium-size effect” from working memory. Their claim appears to be that working memory is largely independent of practice time. Giftedness is the manifestation of performance or production that is clearly at the upper end of the distribution in a talent domain even relative to that of other high-functioning individuals in that domain. Further, giftedness can be viewed as developmental, in that in the beginning stages, potential is the key variable; in later stages, achievement is the measure of giftedness; and in fully developed talents, eminence is the basis on which this label is granted. Psychosocial variables play an essential role in the manifestation of giftedness at every developmental stage. Both cognitive and psycho-social variables are malleable and need to be deliberately cultivated. “Eminence” seems to me to be a very weird criterion for giftedness in adults, as it usually means “fame or recognized superiority.” Fame and recognition rely more on luck than on talent. Is someone not gifted if they choose to do good work in obscurity? Of course, the authors do not use the standard definition of “eminence”, but they “characterize [it] as contributing in a transcendent way to making societal life better and more beautiful,” whatever that is supposed to mean. I don’t think of myself as “eminent”, but I’m certainly in the upper 1.6% of my age group for educational attainment (according to the 2010 US census there are about 300,000 people 55–59 years old with a doctoral or professional degree, out of a total of 19,172,000 [http://www.census.gov/hhes/socdemo/education/data/cps/2010/Table1-01.csv]). I’m one of 164,843 faculty at a PhD-granting university in the US [http://chronicle.com/stats/productivity/], which puts me in the top 0.12% academically of 30–64-year-olds. Does this make me “gifted” by their definition? Probably not, since I’ll never have a Nobel prize (and probably not even a lesser prize). I’ve contributed to society—a couple of patents, dozens of journal papers (some of them well cited), a number of students taught, … —but not in a “transcendent way”. For the authors, the whole point of gifted education is to produce eminent adults (according to their rather nebulous definition). The authors begin with this production of eminence as a premise, not subject to discussion and certainly not open to scientific testing: “outstanding achievement or eminence—with its attendant benefits to society and to the gifted individual—ought to be the chief goal of gifted education.” This premise seems to argue for a pressure-cooker approach to teaching the gifted—that it is better to burn out dozens of gifted kids if one eminent individual results, rather than getting them all to be productive and happy, but not getting any superstars. Our focus here is on giftedness as a developmental process that is domain specific and malleable. Although the path to outstanding performance may begin with demonstrated potential, giftedness must be developed and sustained by way of training and interventions in domain-specific skills, the acquisition of the psychological and social skills needed to pursue difficult new paths, and the individual’s conscious decision to engage fully in a domain. The goal of this developmental process is to transform potential talent during youth into outstanding performance and innovation in adulthood. They base the need for a new definition on their claim that children identified as gifted often don’t achieve eminence and that eminent adults were often not identified as gifted when they were children. Since eminence of (some) adults is the only endpoint they care about, all parts of their definition must serve that goal. This process of talent development can be conceptualized as having two stages. First is talent identification: continuous targeting of the precursors of domain-specific talent and the formal and informal processes by which the talent is recognized and identified. Second is talent promotion: how the person demonstrating talent is instructed, guided, and encouraged—a process too often left to chance rather than to strategic and targeted societal effort. This process also involves recognizing that domains of talent have different developmental trajectories and that transitions from one stage to another are influenced by effort; opportunity; and instruction in content, technical, and psycho-social skills. But the underlying reasoning seems to be circular—they define their terms so that they will support the conclusions they want to reach. First, what factors contribute to giftedness? Second, what are potential barriers to attaining the gifted label? Third, what are the expected outcomes of gifted education? Fourth, how should gifted students be educated? I wonder a little about the significance of the second question. Why should the “label” matter, and why should barriers to getting the label matter? Perhaps they meant to ask how gifted children can be identified, but phrasing it as “barriers to attaining the gifted label” seems to presuppose that the gifted label is a thing to strive for. The other questions seem more normally phrased. In discussing whether or not IQ is innate or environmental, they correctly point out that both genetics and environment are involved, but they use the technical term “epigenetics” incorrectly, and make the somewhat bizarre statement: “General ability or g is derived from both genes and environment. Both are modifiable.” Sorry folks, but gene therapy is certainly not at the point where we can modify genes in order to improve general intelligence. Subotnik, Olszewski-Kubilius, and Worrell do address the “smart-enough” meme, which the refer to as the “ability-threshold/creativity hypothesis”. They cite several studies that refute it, pointing out the studies that supported it generally had low ceilings for performance and short time frames, so that differences in adult performance at the high end were not distinguishable. One rather terrifying aspect of the article is that they serious consider whether emotional trauma is important to achieving eminence and whether parental push to achieve eminence is crucial: “However, encouragement and stimulation were not necessarily accompanied by emotional support. Despite this, and to the extent that outstanding achievement was the goal, the parents seemed to have contributed to their children’s attainment of eminence.” Given the authors’ single-minded insistence on eminence as the only worthy goal of gifted education, this section of the paper sounds remarkably like they suggest child abuse as a form of gifted education! I eventually finished the 40-page article, though I did not bother with the additional 14 pages of citations (far too many of which were self-citations [Correction: only 43, about 9%, were self-citations]). I found the authors rather narrow-minded about the goals of gifted education, and so their policy and research suggestions seemed rather narrow-minded as well. I hope that Subotnik et al.’s document does not become a guideline for future gifted education policy and research, though that was clearly the intent of the authors. 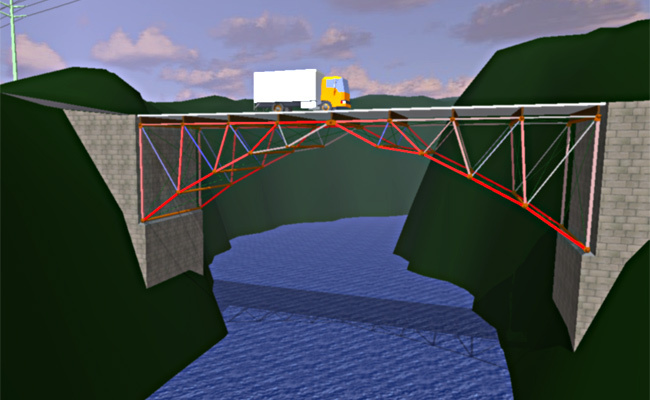 I wasted half a day playing with West Point Bridge Designer 2011, a free game released as part of a contest each year by West Point. I have been unable to get to the contest web page for more details that what is incorporated into the game software. So far as I can tell, the contest is for middle school and high school students to design a bridge that meets load limitation requirements for the lowest possible cost. The cost model is simple, but tricky, as it includes costs for both the weight of the different sorts of steels and the number of different dimensions of tubes that are needed, as well as the number of connectors. The costs of excavation, fill, and abutments are also estimated. Each year West Point releases a new version of the software with a new bridge-design challenge, and with various upgrades to the software. Older versions of the software ran only on Windows, but the 2011 version runs on Mac OS X as well, and there is some talk in the documentation that they might support Linux in future (if there is demand). Sample designs are given, but they are ridiculously overbuilt—much more expensive than even my first try at building a bridge, when I didn’t even know the cost model, but was just building a bridge that looked pretty and making the beams thicker until it held up. I suppose they were included to make kids feel good about their design skills fairly quickly. The software gives templates for some standard trusses (Howe, Warren, and Pratt), which helps particularly in creating arch bridges. I’ve not played around much with other sorts of bridges, but I managed to make several different arch bridges for about $167k (with the symmetric load—it took me about $170k for the asymmetric load). For all of them, I modified a Pratt truss, as it seemed to be the cheapest for the needed strength. Tweaking got me something between a Pratt and a Warren truss. In the animation, the bridges flex rather alarmingly, because the vertical deflection is exaggerated, unless you turn that feature off in the animation controls. Of the 21 “Science and Health” sites, I had previously visited only 4 (MIT OpenCourseWare, Khan Academy, Wolfram Demonstrations Project, and Scitable), none of which had ended up being useful to us, though I could see some value in each. The other sites in this category look like more of the same (several other university open courseware sites, for example). I have no interest in learning about “Business and Money” and have never visited any of the 12 sites listed under that category. Similarly for the 14 sites under “History and World Culture”, several of which seem more focused on genealogy and biography more than history, and history much more than culture. I also have no reason to visit the 10 “Law” sites, which seem to be mainly from law schools (perhaps as advertisements from the schools), though I do occasionally look up things in the local ordinances (http://www.codepublishing.com/CA/SantaCruz/) and state laws (http://www.leginfo.ca.gov/calaw.html). In both cases, I would prefer a more transparent posting of the laws, so that I could use a better search engine to find things—the database search engines provided are terrible. The “Computer Science and Engineering” has 13 listings, but does not include Stanford Engineering Everywhere, nor does it include some of the most important learning tools (Scratch, Alice, Python online tutorial, Project Euler, …), leading me to suspect that the author of the list really did not know much about what online self-teaching resources were available, and just had dumped the results of some Google searching. The 9 math resources showed a similar lack of depth. The 8 “English and Communications” resources looked a bit better, though National Novel Writing Month is not really an online educational tool. I am particularly interested in finding writing resources for my son that will get him past his writer’s block and through high-school English, but the list here did not seem to be very useful for that rather specific problem. For one area of this field that I know something about (technical writing), the advice at Writing Guidelines for Engineering and Science Students seemed rather thin and not particularly helpful for the sorts of problems I see in student writing. None of the resources here looked particularly useful for our needs, though I kept hoping that I’d find some gem I’d previously missed. Of the 6 “Foreign and Sign Languages” sites, I have heard good things about two, BBC Languages and Livemocha, but I’ve not used any of the sites, and we prefer to have our son take language classes at the community college, where he can get face-to-face interaction with others as well as detailed instruction in grammar and vocabulary. It may be possible to emulate that experience by combining different web-based sites, but it would be much harder to maintain engagement than with a regularly scheduled class. In fact, that is a major problem with most of the on-line learning resources: it requires considerable dedication to stick with the learning and do the necessary practice in the absence of teachers, classmates, and regularly scheduled homework deadlines. The 19 “Multiple Subjects and Miscellaneous” are indeed quite varied. I’ve heard of iTunes U (though not used them, since we find video lectures a particularly boring and slow way to learn), Brigham Young Independent Study (we’d investigated their non-free online high school classes and decided that none of them were suitable for our needs), and TED (again, we find video lectures—even TED talks—extremely boring). The 20 “Free Books and Reading Recommendations” look useful, though I’ve only ever used Project Gutenberg and Scribd (and Scribd only because some teacher-bloggers put handouts and other documents they are discussing on the web via Scribd). There are several sites claiming tens of thousands of books to download for free, but I’m wondering whether they all have the same core of books with copyright expired, and that the union of the different sites is not much larger than the largest single site. It would have been useful for the list creator to have merged the free-book sites into a single comparative entry, suggesting which order to try sites in to find a free book fastest, or giving some other hints about how to prioritize a search. Right now, I suspect that Google books (which was not listed) provides a more comprehensive list of free books than any of the sites listed, though the free audio books through Books Should Be Free may be an otherwise difficult-to-find resource. The 9 entries under “Educational Mainstream Broadcast Media” provide access to educational content associated with TV shows. There are a few good things there, but you probably need to know precisely what you are looking for, so access through a search engine seems more useful than through the home pages of the content providers. The 8 entries under “Online Archives” look interesting—I did not even suspect the existence of some of them. The only one I’ve used is U.S. Census Bureau, which has a lot useful information—unfortunately, it can be very difficult to find the information on their web site. Of the 4 “Directories of Open Education”, the only one I’ve used is Google Scholar, which has slowly become a decent way to search the scholarly literature (the indexing used to be terrible, but now it seems to be only a little worse than much more expensive dedicated indexing). I’ve tried using OpenCourseWare Consortium, but the organization and indexing seems to be poor, and it takes a lot of clicks to get information about specific courses. Finding courses that meet particular criteria is nearly impossible (say, for example, that I was looking for a course that taught Java to someone who already knew Python—how many hundreds of “course details” links would I have to click to find out whether there was such a course or not?). 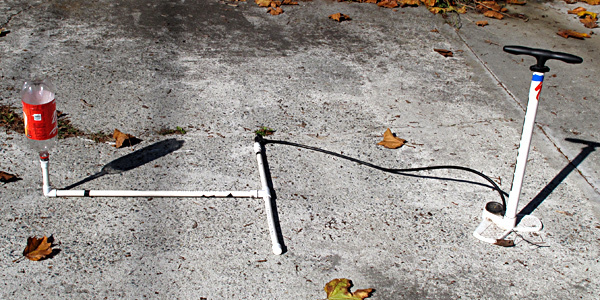 Starting several years ago, when my son was in kindergarten, I’ve made a number of very simple launchers for soda-bottle rockets. It started with a little talk and demonstration of pressure I gave to my son’s kindergarten class. I had several small activities, but the most impressive was a soda-bottle water rocket. Here are some plans I wrote up for the launcher: (PDF format) (instructions in Spanish). The design of the launcher is simpler than many, as it uses just a friction fit to hold the bottle in place, and the rocket launches as soon as the pressure gets high enough, rather than using a more complicated retention and trigger mechanism. This does add an element of unpredictability to when the rocket launches and makes it harder to do experiments that involve adjusting the pressure precisely, but the launcher is very easy to make and the relatively low pressure on release prevents bottles from exploding. I started with an in-class circle talking about pressure. I had each student feel the air pressure against their fingers from a bike pump, then showed them water shooting out small holes in the side of a bottle (noticing how far the water went for different amounts of water above the hole), then had them get in a circle holding hands (the bottle), and had some of them play the role of water molecules bumping against each other and the “bottle”. After that we went outside to launch the rockets. During the next week the kids decorated their own rockets with stickers and markers, and we had another launching where each child launched his or her own rocket. It was great fun, and the activities could easily be adapted to older students (by having them do some actual experiments). For Fiesta de los Artes at the same elementary school when my son was in second grade, I set up a rocket-decorating table with 5 rocket launchers—it was a very popular activity. Using colored (and black) vinyl electrical tape proved to be the most popular decorations, though shiny metallic paper with adhesive backing was also popular. Lick-and-stick stickers were not very popular, but 1-cent kestrel stamps were moderately popular, and much cheaper than commercial stickers. I still have two of these launchers in my garage, but I haven’t launched a soda bottle for a couple of years. After seeing the post Threaded Lamp Rod Process, I’m strongly tempted to try again. The idea there is to join two 2-liter bottles bottom-to-bottom with threaded lamp rod to make a 4-liter rocket. Will the bigger rockets be too heavy for this launcher? (The T-joint unscrews to make the launcher easier to carry on a bicycle.) Will the bigger rocket need more pressure, and hence a positive retention system and trigger release? I wonder if I can work soda-bottle rockets into the calculus-based physics class we’re doing as home-school this year. They are certainly a nice demonstration of conservation of momentum. I don’t know whether we can make adequate computational models of the rocket though, as I think that the exit speed of the water depends as much on frictional forces that are hard to model as it does on pressure and nozzle area. If we can get good enough video of a launch we might be able to estimate how long it takes to empty the water from the bottle and how fast the bottle is moving, which may be enough to do some decent modeling.